Get in touch with nature at Routeburn Track and Fiordland National Park (Te Wahipounamu). 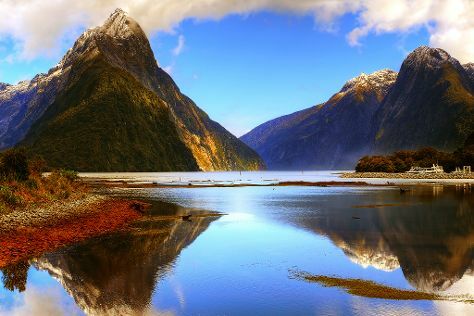 And it doesn't end there: explore the activities along Milford Sound, look for all kinds of wild species at Ivan Wilson Park, and trek along The Chasm Walk. To see other places to visit, where to stay, and tourist information, you can read our Te Anau route builder app . Kuala Lumpur, Malaysia to Te Anau is an approximately 18.5-hour combination of flight, bus, and taxi. You can also do a combination of bus, flight, and taxi; or do a combination of train, flight, bus, and taxi. The time zone changes from Malaysia Time to New Zealand Standard Time, which is usually a 4 hour difference. Cap off your sightseeing on the 2nd (Sun) early enough to catcht the bus to Queenstown. On the 3rd (Mon), identify plant and animal life at Kiwi Birdlife Park, get some thrills on the water with a speed boat tour, and then take in the exciting artwork at Silver Fern Gallery. Here are some ideas for day two: take a memorable tour with Tours and then have some family-friendly fun at Skyline Queenstown. For reviews, maps, and tourist information, refer to the Queenstown holiday planner. You can take a bus from Te Anau to Queenstown in 3.5 hours. Finish up your sightseeing early on the 4th (Tue) so you can go by car to Fox Glacier. Kick off your visit on the 5th (Wed): take your sightseeing to a higher altitude at Fox Glacier, then take in the dramatic natural features at Franz Josef Glacier, and then trek along Terrace Walk. On the next day, enjoy the sand and surf at Gillespies Beach and then explore the activities along Lake Matheson Walk. Ask Inspirock to suggest an itinerary and make planning a trip to Fox Glacier fast, fun, and easy. Traveling by car from Queenstown to Fox Glacier takes 4.5 hours. Alternatively, you can take a bus. 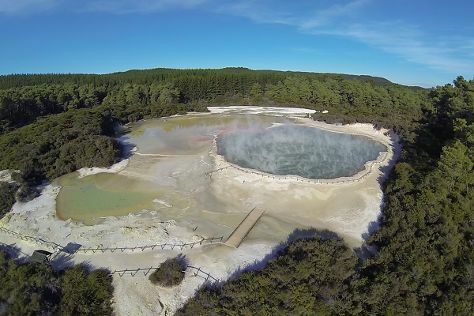 Wrap up your sightseeing on the 6th (Thu) early enough to travel to Rotorua. Start off your visit on the 7th (Fri): take a peaceful walk through Redwoods, Whakarewarewa Forest, then take in the natural beauty of Te Puia, then take in the natural beauty of Wai-O-Tapu Thermal Wonderland, and finally look for all kinds of wild species at Redwoods Treewalk. Get ready for a full day of sightseeing on the next day: hike along Lake Okareka Walkway and then look for all kinds of wild species at Rainbow Springs Nature Park. To find reviews, traveler tips, maps, and more tourist information, you can read our Rotorua trip itinerary builder website . Getting from Fox Glacier to Rotorua by combination of car and flight takes about 11 hours. Other options: do a combination of bus and flight. June in Rotorua sees daily highs of 18°C and lows of 9°C at night. Finish your sightseeing early on the 8th (Sat) so you can drive to Waitomo Caves. Kick off your visit on the 9th (Sun): stroll through Ruakuri Walk, then see the top attractions with Sightseeing Tours, and then Head underground at Waitomo Glowworm Caves. To see other places to visit, more things to do, traveler tips, and more tourist information, you can read our Waitomo Caves day trip app . You can drive from Rotorua to Waitomo Caves in 2 hours. Another option is to take a bus. On the 10th (Mon), you'll travel back home.